If the computer is managed by ECS, there should be a tag placed on the CPU with the computer's name. The name will be like "ENGR-D-COE047". The first letter after ENGR may be A (administrative), D (department), or L (lab). If there is no tag on your computer, read below how to find the name for the various types of computers. Click on the Window icon in the lower left corner, then select the Settings gear icon. Your computer name is listed under Device specifications/Device name. In this example the system is named "ENGR-A-COExxx"
From the Start button (usually in lower left of screen), select Computer, then right click the mouse to select Properties. Your computer's name is in the third section "Computer name, domain, and workgroup settings." In this example, the computer names is A-COE012. Alternatively, go to Computer | Control Panel | System. You will get the information as shown in the image above. The prompt on a Linux machine is the current user@machine name, e.g., bgreene@l-lnx015 is on the Linux workstation l-lnx015. 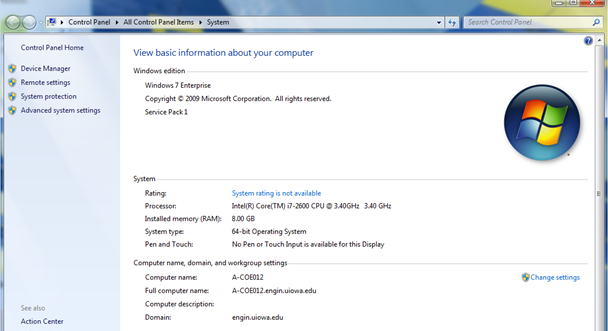 Using the graphical interface you can find the machine from the start menu (lower left) | Computer, |System Information. 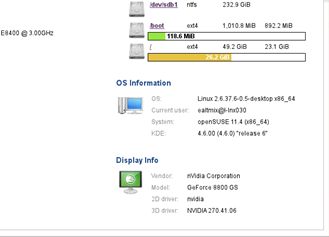 In the resulting window in Os Information, the Current user is xxxx@l-lnx030, for example. Start from the Apple menu (top left) and select Systems Preferences. 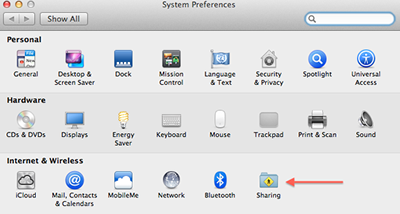 On that screen, select Sharing (note the arrow pointing to Sharing in image below). The computer's name is shown at the top of the Sharing screen, as highlighted by the red arrow. Contact the Engineering Help Desk, 1253 SC, 319-335-5055, if you need assistance finding your computer's name.